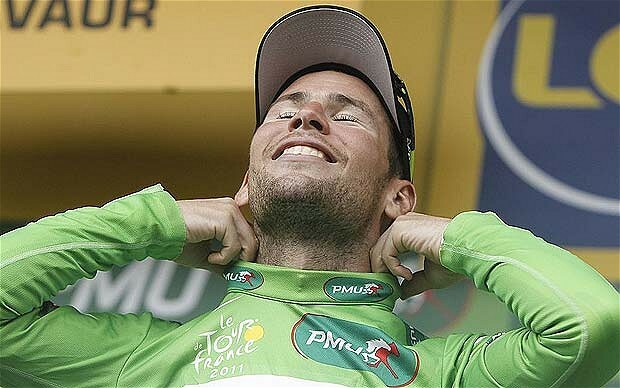 Mark Cavendish – What a year!! Only a few more days to Christmas!Its a time to reflect on the year and one person who has certainly been doing that is Mark Cavendish, a British Champion!! The awards season is upon us and, rightfully, the garlands, MBEs et al, are all being given to a man who has elevated British sport into new realms of achievement this past 12 months. Except such self-satisfaction is simply not Cavendish’s way. “You know, the problem that so many people have with any aspect of life is that they achieve something and then they sit back and admire it. Well, they’re not going to progress,” he says. “I’ve never, ever sat back and admired what I’ve done. It’s been the downfall of so many riders. I don’t want that. Set a target, achieve it, and then set another target and keep setting them. That’s how you move forward.” Records? Forget them. They mean nothing to this serial record breaker who is currently putting himself through his paces during his vigorous winter training! Cavendish has, incredibly, now won 20 Tour de France stages in the last four editions, making some believe that his sprinting ability is soo out of this world that he could one day surpass the peerless Eddy Merckx’s landmark of 34. “Ever since I was young, anything I did, I just had to be the best I could be, the best out of everyone, whether it be sport, academic work, whatever,” he explains. Only the best could, in the space of one month next year, firmly expect to end up successfully defending his green jersey as the Tour’s top sprinter one Sunday on Paris’s Champs-Élysées and then in London six days later sprint down the Mall for gold in the Olympic road race. No one before has ever done that and if Cavendish doesn’t, then he will consider it a failure. He says he joined Team Sky because he believed that he could win green while team-mate Bradley Wiggins could land a historic winning yellow. As for the Olympics? “I hope I’ll light a fire by being the first British champion of the Games; it’s what I want and what I plan.” And if it’s not gold? Then there are his team-mates. Cavendish may be seen as a singular customer but he’s always the first to emphasise how he would be nothing without the good fortune to have been served by trusty colleagues like Mark Renshaw, his Australian lead out man with HTC-Highroad. “It’s very hard for me to trust people but when I do, they’re really in close with me. I give them 100 per cent loyalty but I expect that back too. When you see how they give you more than 100 per cent, you can’t let them down. I’m driven by a fear of failing the people who’ve always delivered for me. “My main quality? An overwhelming desire to win and a fear of losing. I really don’t like losing.” And it has created in him a perfectionist’s streak . Cavendish has soo much more to give yet, we cant wait to see what 2012 brings! So who will you be voting for this Thursday? Vote for the Manx Missile. You know it makes sense. This entry was posted in Sports News!, Sports Personality!, Uncategorized and tagged BBC Sports Personality, Mark Cavendish, Oakley, Olympics. Bookmark the permalink.